Ear Disease – is your pet affected? 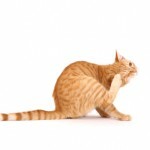 Do you notice your pets scratching their ears? Are there signs of redness or discharge? 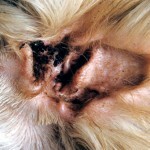 Unlike the condition in people where “earaches” commonly involve the middle and inner ear, most ear problems in pets occur in the outer or external ear canals (see diagram right). 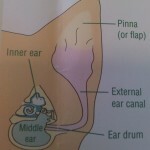 The ear is protected externally by a pinna (or flap). 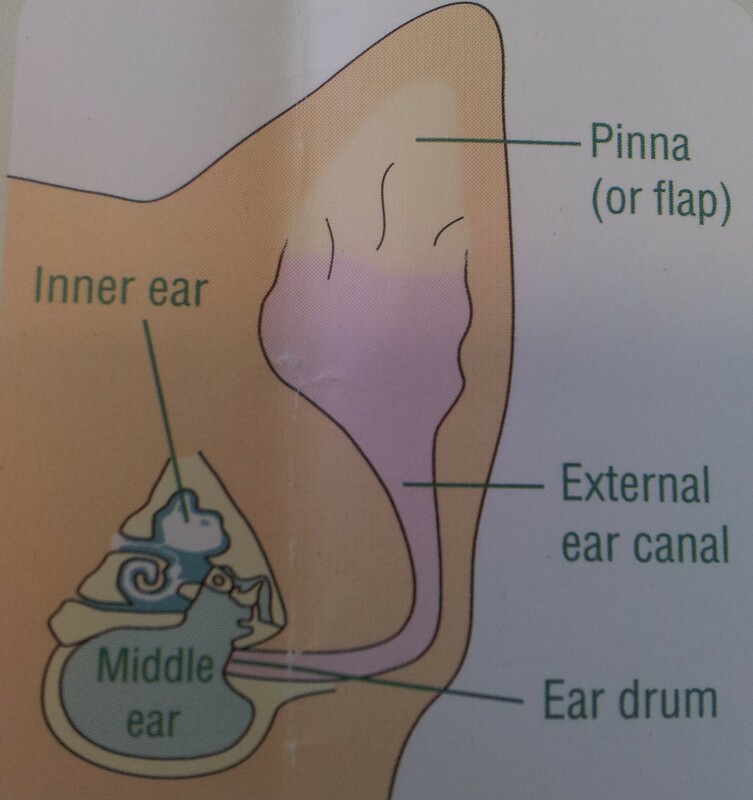 Sound is collected by the pinna and then travels down the narrow external ear canal to the ear drum, where is passes onto the middle and inner ear. In the healthy ear, the opening to the external ear canal is lined with smooth pink (or pigmented) skin, with no evidence of any redness or discharge. As mentioned above, most ear problems seen in pets occur in the external ear canal – a condition called otitis externa (sometimes called canker). Signs of otitis externa commonly include ear rubbing, head shaking and reddened irritated skin lining the external ear canal. Additionally there is often discharge. Ear mites (Otodectes cynotis) are a tiny spider like parasitic mite that infect ears of dogs and cats causing irritation and a crusty brown discharge. Foreign bodies – such as a grass awns of the meadow grasses are a particular problem in the summer months and can easily get stuck right down by the ear drum – see photo right. 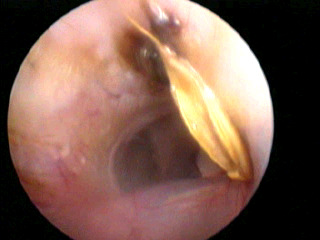 Localised allergies affecting the skin lining the external ear canal are another common cause. These are often part of a more generalised allergic skin condition also affecting other body areas. 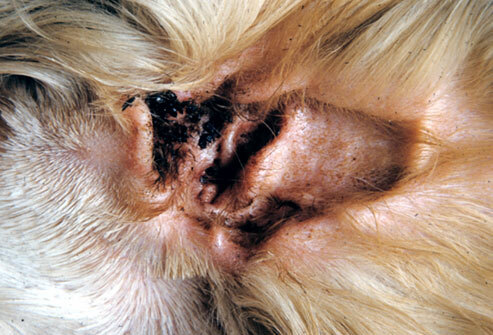 In many instances of ear problems, scratching the affected area leads to opportunistic bacterial and fungal infections colonising the ear canal which can both obscure diagnosis of the underlying cause and, worse still, complicate treatment of the otitis externa. In common with many conditions, the key to success with otitis externa is early diagnosis and treatment. 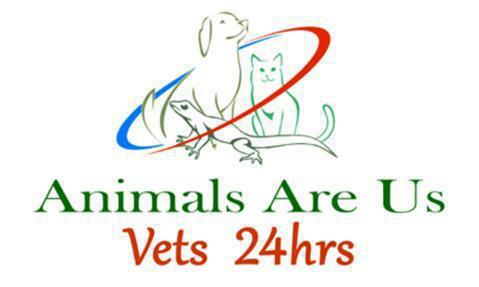 If you pet is showing any of the symptoms described above, please bring them in for a thorough examination since the sooner we can start treatment the better!